On July 22nd, 1988, I traded my 64 Kb CoCo 2 + 100 US$ for this beautiful CoCo 3. The only extra hardware we had were 1 or 2 joystick (depending on how long they laster and if there were some available at the only Radio Shack representative in the country), a CCR-81, and a TV. By the early 90s, we were able to get a Sound/Speech pack, an Orchestra-90, and a floppy controller with a ragtag drive setup. These were stolen when out house was broken into a few years later. 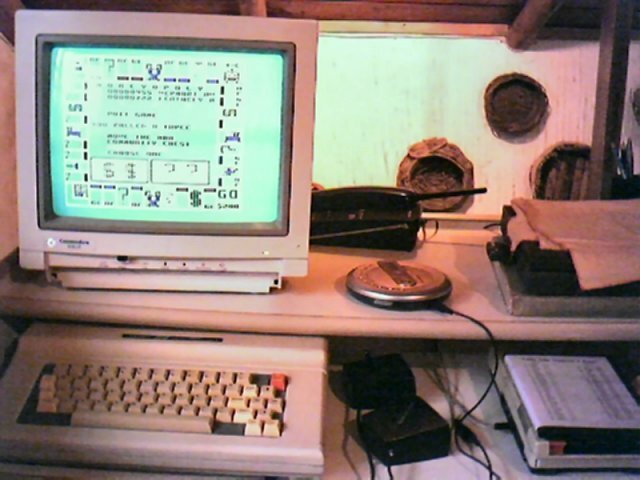 Eventually, I was able to get a Commodore 1084 monitor. At that time, I had no idea how to use it with the RGB connection, but the composite was still better than a TV. This picture was taken in 2006. It has an '86 GIME and 128 Kb of RAM, but I have a 512 expansion waiting for her.